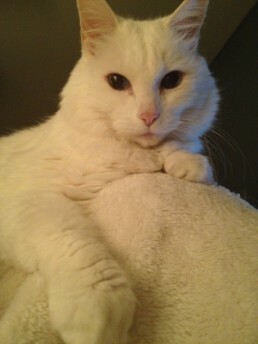 Shammie, a hearing-impaired kitty, lives with Ms. Baker and her 91-year-old mother, who suffers from dementia. Shammie depends on Ms. Baker for security since she is unable to hear, and Ms. Baker in turn depends on Shammie for unconditional love and comfort when her own mother becomes combative and confused. The family lives on a very meager budget. Shammie recently had several masses that were causing her pain and needed to be removed. Unable to afford the costly surgery, Ms. Baker was at a loss for how to care for her beloved pet. Thankfully, TVMF was there to help. Shammie’s veterinarian applied for a Rusk Veterinary Assistance Grant to defray the cost of the surgery. That surgery was a success, and now Shammie’s family can look forward to many more years with their sweet kitty.